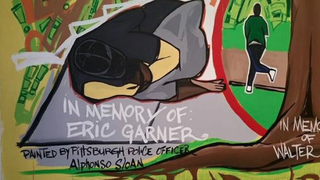 Pittsburgh Police Officer Alphonso Sloan paints images protesting police brutality. The image shown is Sloan’s depiction of Eric Garner’s fatal encounter with police in Staten Island, N.Y., in July 2014. Pittsburgh Police Chief Cameron McLay said he’s proud of an officer’s courage to “speak difficult truths” through his artwork, which protests police brutality against unarmed black men, the Pittsburgh Tribune-Review reports. “The preservation of human life, all human lives, is the most foundational value in the policing profession. His statement against police misconduct is not an indictment of police, it is a call to action for social justice for all,” McLay said in a statement released by the Pittsburgh Bureau of Police, according to the Tribune-Review. Officer Alphonso Sloan’s mural shows images of a white police officer shooting a fleeing Walter Scott, an officer choking Eric Garner as he struggles to take his last breath and a “Black lives matter” demonstrator protesting these scenes. It’s part of a new downtown-Pittsburgh art exhibit. “These incidents have been happening, and it doesn’t appear they’re going away. This is my way of peaceful protest,” he told the Tribune-Review. McLay, who is white, faced a backlash earlier this year for displaying a sign that read, “I Resolve to Challenge Racism at Work. #End White Silence.” A photograph of McLay holding that sign sparked an uproar within Pittsburgh’s law-enforcement community. The Pittsburgh police union president, Howard McQuillan, accused McLay of calling the city’s police department racist, KDKA-TV reported. It’s uncertain whether McLay will face another round of backlash, this time for praising Sloan’s artwork. On July 11, Pittsburgh Public Safety spokeswoman Sonya Toler said the bureau had no reaction to Sloan’s mural. One day later, she explained that McLay chose to comment once he learned about the artwork. Read more at the Pittsburgh Tribune-Review here and here.